In many families, a "proper" holiday meal requires not just the mandatory turkey, but a familiar set of side dishes and sauces as well. One of those is tart, brightly colored cranberry sauce, a bright and seasonally appropriate foil for the rich-tasting bird. Although canned sauce is tasty and readily available, homemade cranberry sauce has a distinctly fresher flavor. It's also startlingly easy to make, a key factor when you're knee-deep in holiday preparations. Aside from the cranberries, the base of your sauce is a mixture known to chefs as "simple syrup." This is just equal quantities of sugar and water, boiled together for a few minutes until the sugar is well dissolved. If you're using 12-ounce bags of cranberries, you'll need at least 1 cup each of water and sugar per bag of berries. Increase that to 1 1/2 cups for each pound of berries or up to 2 cups if you like your sauce "sauce-ier." 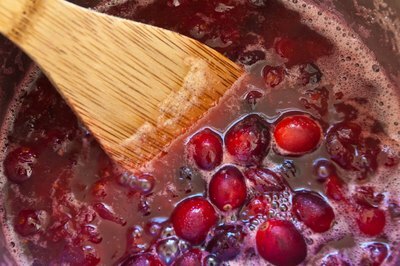 Pour the berries into your boiling syrup, and simmer them for up to 10 minutes unto they've begun to pop in the hot liquid. When you cool the mixture, the berries' natural pectin sets the berries to a loose, jam-like texture. That standard version of cranberry sauce has an elegant simplicity of its own, but you should feel free to tweak the formula. Cranberries pair well with citrus, for example, and replacing your water with orange juice broadens and deepens the sauce's flavor. 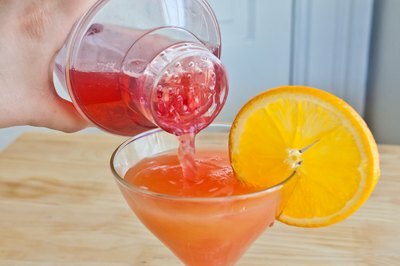 The effect is magnified if you also add orange zest to the syrup or a splash of your favorite orange-flavored liqueur. A pinch of allspice or clove can also add an interesting note to plain cranberry sauce, or you can make cranberry chutney instead by spicing it with cinnamon, ginger, coriander and other spices. Plain or enhanced, your sauce has plenty of uses beyond the turkey. If you like to offer a ham at the holidays as an alternative to the big bird, cranberry sauce -- especially the orange-flavored or spiced versions -- is an equally good complement to the pork's sweet and savory flavor. It also works well with the richness of duck or goose, at the holiday table or between family meals. Leftovers can be used up in day-to-day meals. 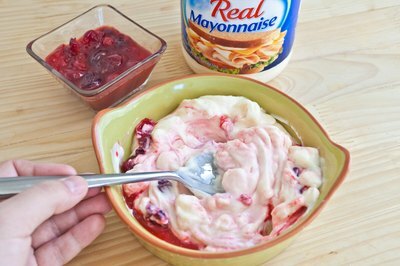 Mash extra cranberry sauce or cranberry chutney into mayonnaise to make a condiment for your sandwiches or into low-fat cream cheese as a spread for canapes. One of the less-common alternative uses for your sauce is as a mulled beverage. You can add a few spoonfuls to your favorite mulled wine or cider, but the cranberries make a fine beverage. 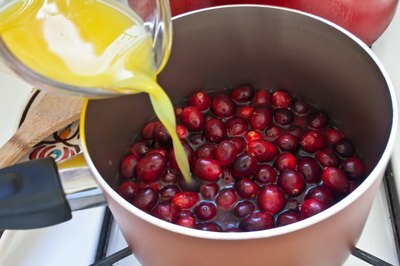 Use leftover sauce or start from scratch, using the same proportions as for cranberry sauce; then double the quantity of water once the berries begin to pop. Add cinnamon sticks, allspice or other spices to taste, and float a few orange slices in your pot or slow-cooker. Taste the mixture, and add sugar or berries until its flavor is nicely balanced. 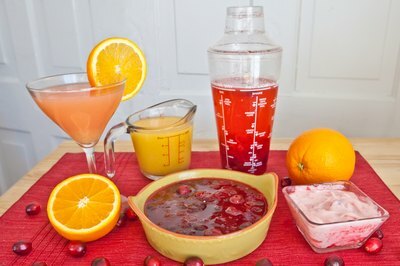 You can stretch the mix, and give it a deeper color, by adding commercial cranberry juice.